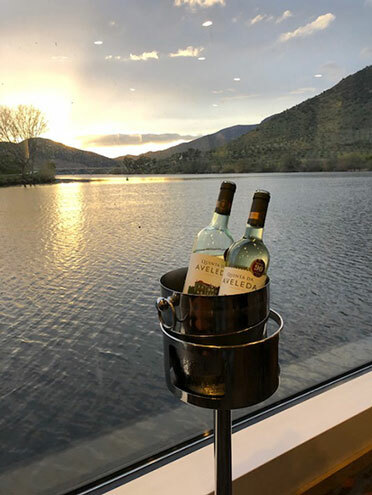 One of the first things about river cruising and cruising on the Douro River in particular, is that the whole venue is often about wine; the growing of grapes, its production and wineries to tasting tables. Even on the ship, we had wine for lunch and wine for dinner. There was a funny poster somewhere that said that "Breakfast is the meal without wine", but even there we sometimes had champagne for breakfast. The photo below includes an astronomical theme; sunset on the Douro, and wine bottles next to our ship dinning room table. How did that ice bucket get into the picture, you might ask? Hey, its a cruise ship, even though it only has about 100 passengers, and serving wine at lunch and dinner at each table is just part of how it works! And when we went ashore for an excursion there were plenty of wineries and tasting rooms along the Douro River. 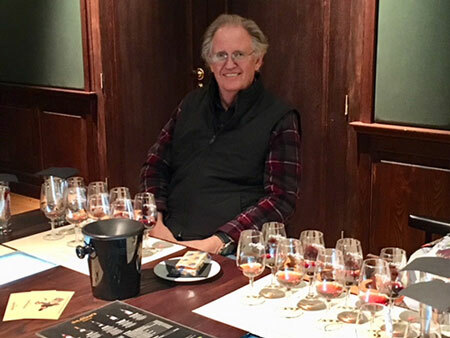 We stopped at the Sandeman winery and then stopped at the Graham's winery for dinner and tasting of 8 pours of Port, ranging from 10, 20, 30, and 40 years. Luckily, I found that my wine palette is easily satisfied by the 10 year old Port, so I don't need to buy 40 year old Port. After having wine for lunch and dinner, one might expect that your vision could be a little distorted, but sometimes we can be confused by optical illusions, such as seeing canals on Mars, etc. 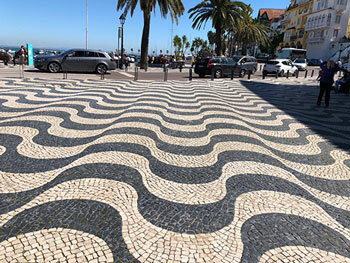 We found one instance of an optical illusion during our onshore excursions. The photo below shows some impressive tile work near a boardwalk at the river edge. It sure looks as if the tiles were placed after consuming too much wine, but it is in reality completely flat. Trying to walk along on this tile walkway took a bit of effort so as not to be confused by the optical illusion and concerned about tripping and stumbling. On our cruise on the Douro River, we had many opportunities to leave the ship on shore excursions and this was our chance to see and explore some of the local countryside. 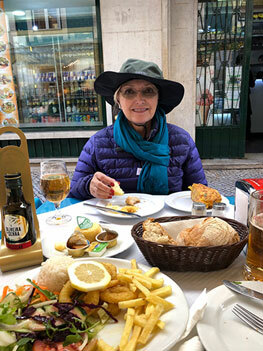 The weather was mostly cloudy and rainy on some days so that when we were ashore it was not uncommon to run inside a local tapas bar or restaurant and sample the local cuisine. In the photo below, Resident Astronomer Peggy, complete in her rain garb, sits down for lunch out of the rain. Sometimes, we didn't even have to wait for it to rain and it was always easier to find a convenient restaurant for just a cup of expresso, or a glass of wine or beer, and of course any of the local sweet pastries. 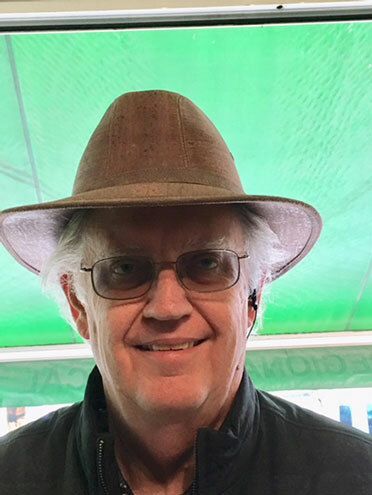 For my self, for my raingear, I elected to pickup a local hat made out of cork. Cork is a great product that is turned into many very useful products, not just corks for wine. Resident Astronomer Peggy also picked up a purse made out of cork. Also, when my walking shoes failed and the sole came unglued, I almost out of necessity had to buy a new pair of shoes and again elected to bring home a pair of cork shoes. Cork is very pliable and soft and looks and feels almost like leather. Ok, I suppose I have to show at least one picture of one of the historic cathedrals that we were able to visit. 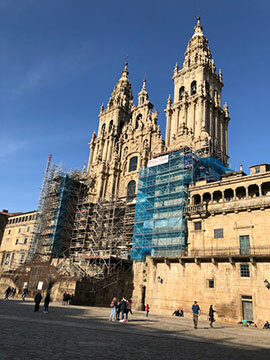 The photo below shows the Santiago Cathedral, which for you all that follow such things, is know to English speakers as St. James Cathedral. The construction of this site began in 1075 and I found it pretty impressive to walk around and see this structure and all the art within. We had seen so many other just as old churches that it was easy to get caught up in the negative feeling of its just ABC syndrome (Another Bloody Church), but I still find it fascinating how this large engineering project could have been designed, financed, constructed and managed at that time? Finally, along that same topic of history and recognizing the importance of Spain and Portugal in creating the infrastructure to find and discover the new worlds across the Atlantic. We heard stories about Henry the Navigator, about Magellan, about Vasco de Gama, Columbus and many others. 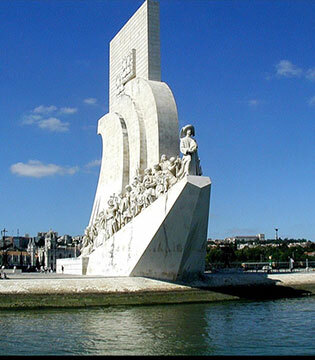 This monument on the side of the Tagus River, in Lisboa, was created in remembrance. During several stops along the coast of Portugal, I remember looking out towards the Atlantic Ocean and wondering, much as those early explorers, what was out there across all that water? 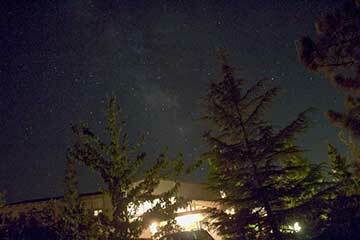 This wonder and desire to understand the unknown is still with us today as it must of been then also! 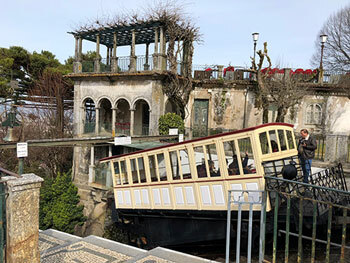 And, finally, finally, for all of you physicist wannabes, we found this wonder old hydraulically powered funicular near our stop in Braga. We did not ride the funicular, but we were told how the operators of the funicular use a series of bells to communicate between the car at the top, as seen here, and the car at the bottom of the hill. So how does it work? The two cars are connected by a cable over a pulley wheel so that when one car descends the other car is pulled up the hill. The weight of each car is the same except for the weight of the passengers. To make the top car go down the hill, the car is filled with just enough water so that the downward force of gravity overcomes the friction of the system, and it will descend the hill and pull the other car up the hill. The operators apparently use a system of bells to tell how many people are in each car and the amount of water added to the top car is increased just enough to ensure the top car will move down hill when released. Can you write the control equation that includes the differential number of passengers, assumed weights, frictional forces to be overcome, gravitation force depending on the angle of the slope, and the amount of water needed for the whole thing to work each trip up and down? I wonder how the acceleration and final speed of descent is controlled? When the car that was initially at the top of the hill reaches the bottom, the water in that car is released and the other car now at the top is ready to be filled with just the right amount of water. Pretty neat! While I was working, I worked on many propulsion system studies and if I had been in charge of designing this system, I would have considered a rotary motor to turn the pulley to move the cars back and forth or maybe even a linear motor to move the cars up and down. Luckily, I was not in charge of the system when it was built in the 19th century, because I would have screwed up a perfectly good solution! Now that we are back at the observatory, hopefully after the clouds go away, we can see if the teeny weeny telephoto IPhone lens accessory (as described in the previous March 23 and March 31 posts), with the long exposure app and remote shutter trigger delay, can capture Jupiter's moons!